It’s commonly known that many virtual desktop infrastructure (VDI) deployments fail when trying to scale beyond 300 desktops. In this session, experts from Cisco and VMware will review the pitfalls they have seen in deployments, and outline recommended steps IT professionals can take to build a rapidly scalable, high-performing virtual workspace. With the landscape of desktop and application virtualization constantly changing, the new Cisco UCS M-Series Modular servers offer a low cost, small foot print solution for high density XenApp workloads. UCS M-Series servers are composable infrastructure that disaggregates storage and networking from the CPU/memory allowing workloads to be optimally matched to resources. In this webinar we’ll talk about how you can support 960 XenApp users in a 2RU configuration with excellent performance. Smaller companies and enterprises face the same challenges when it comes to attracting top talent. Both need to offer the flexibility to work anywhere, anytime while retaining control of sensitive data and intellectual property. Desktop and application virtualization can solve this problem, but until now it had been too costly and complex to justify smaller deployments. Join experts from Cisco and discover how the Cisco UCS Mini with Nimble Storage offers a small business-ready infrastructure with enterprise power. You will learn how you can quickly and easily deploy 350 virtual desktops with VMware Horizon 6. Join experts from Cisco and discover how the Cisco UCS Mini with Nimble Storage offers a small business-ready infrastructure with enterprise power. You will learn how you can quickly and easily deploy 500 virtual desktops with XenDesktop/XenApp. Many IT environments are facing the challenge of moving to newer O/S releases like Windows 7, while others wrestle with the cost associated with upgrading client hardware to support that move. The Windows XP End-of-Support milestone presents a compelling opportunity to evaluate your desktop strategy, while intercepting important trends including BYOD, an increasingly mobile workforce, and escalating demands for business productivity and continuity. For many organizations, technologies like VDI and application virtualization can help ease the transition, but not without some hurdles. Attend this webinar to hear from Cisco field experts on how you can increase your chances for Windows XP Migration Success. Desktop virtualization deployments can easily face an escalating CAPEX burden, driven in large part by the cost of servers, storage and networking. In this session you will hear how industry leaders Cisco, Citrix and EMC deliver a high performance, scalable infrastructure for concurrently running Citrix XenDesktop and XenApp while reducing costs with tiered storage architectures. We'll share best practices you can follow to scale seamlessly from a few seats of XenDesktop and XenApp to thousands, bootable in minutes. Come and learn how Cisco VM-FEX, Nexus 1kv, Tier-0 storage and other innovations can optimize your UCS-Citrix deployment environment. Designing and configuring production-ready Desktop Virtualization infrastructures takes planning and expertise. Frequently that expertise is engaged in the form of a professional services contract. But how do companies cope with the realities of expanding those services once the implementation team has moved to other projects? Cisco Advanced Services consultants will share some of the best practices and related solution offerings that have helped customers around the globe automate their virtual desktops deployments. With a repeatable service engagement framework and a field-proven set of software capabilities, Cisco will demonstrate how you can deliver scalable self-service virtual desktop offerings that include all the main elements commonly associated with Private Cloud frameworks. Our senior technical consultants will also illustrate how orchestrating and automating common and repetitive functions enables highly-skilled staff to focus on innovative IT projects while letting software take care of the day-to-day configuration and deployment tasks. Cisco and its ecosystem partners are attacking the pain points traditionally associated with deploying desktop virtualization: cost, complexity, and performance with scale. Four new reference architecture types for desktop virtualization combine best-of-breed technologies with the Cisco Unified Computing System to deliver prescriptive design guidance for IT environments of all sizes. Are you responsible for sizing and implementing the server platform that will host your organization’s VDI implementation? Ever wonder what effect the number of processor cores has on VDI performance vs. core speed? What about the number of vCPU? Our team of VDI-proficient Consulting Systems Engineers have some insights to share that may have you thinking differently about the impact and importance of choices you can make when designing your compute infrastructure for VDI. BONUS: Join us for this session packed with valuable insights, and we’ll provide you with a complimentary brief that explores the findings! This webcast will review the blueprint for successful virtual desktop deployments provided in the Cisco Validated Design (CVD) for VXI. These design guides are newly available and give an assessment and the benefits from working with hundreds of customers to build out a robust virtual desktop solution that is collaborative, secure and mobile. Companies deploying the Cisco Virtualization Experience Infrastructure (VXI) Smart Solution are seeing significant business benefits that include substantial savings in administrative and operating costs—not to mention increased productivity, effectiveness and agility. this webcast will share with attendees how to apply the right framework for your business to asses business value, give Customer examples of Business benefits and TCO from Cisco VXI, including both quantitative and qualitative benefits and Use case examples of how companies are benefiting from VXI. As organizations evolve, seeking to find greater competitive advantage, faster time to market, increased business process resiliency, and reduced costs, Business Process Outsourcing (BPO) is rapidly growing as a preferred means to address these fundamental challenges. This new landscape is creating an increasingly de-centralized operating model for corporations as they leverage talent pools across a global footprint, embracing a “follow the sun” approach to delivering efficient 24x7x365 services to their clientele, or tapping into distributed resources that can reduce operating costs. Attend this session to learn about real world implementations of desktop virtualization that address this increasingly important use case. Like many businesses, Cisco IT is implementing desktop virtualization to support changing work styles while lowering IT costs and reducing risks. Virtual desktops are a critical element of Cisco IT’s next generation workspace strategy is to enable employees, partners and contractors with maximum flexibility to securely access any application, on any device, at any location, anytime. 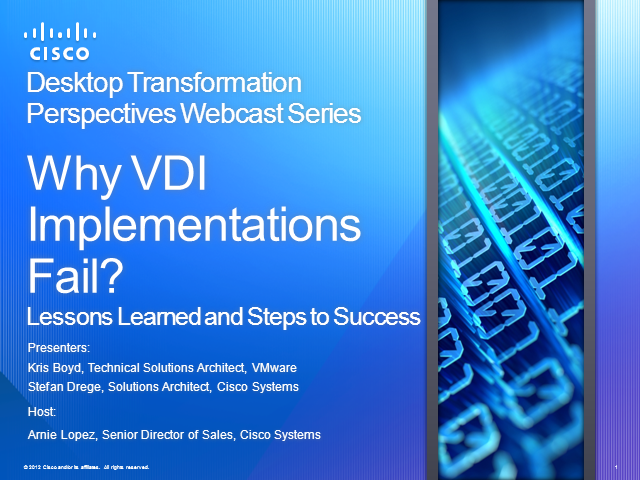 Join us, as Richard Whitmarsh, Senior IT Manager leading the VDI program at Cisco, reveals the business drivers, use cases, challenges, results and lessons learned associated with Cisco’s initial deployment of 2000 virtual desktops. He will also discuss some of the design and architecture obstacles and how Cisco IT overcame these to achieve a secure, scalable and cost effective implementation based on the Cisco Virtualization Experience Infrastructure (VXI) Smart Solution. If you are looking to for best practices for scaling your desktop virtualization deployment, this is a webcast you won't want to miss. According to ABI Research, the worldwide market for hosted virtual desktops is forecast to grow from about $500 million in 2009 to a cumulative total of nearly $5 billion in 2016. While desktop virtualization is on the rise, few businesses have implemented broad scale adoption. Despite the robust solutions provided by virtual desktop software vendors like Citrix and VMware, the network remains the critical path for delivering an excellent and secure virtual desktop experience. As the enterprise workplace continues to change creating new, more efficient ways of working, the compute platforms that power worker productivity need to evolve along with worker behavior. To date, VDI has been an important technology that is used to virtualize corporate desktops, but it too must evolve to deliver not just a virtual desktop but an entire virtual workspace. Learn how desktop virtualization can meet the security, regulation and operational challenges of BYoD initiatives, while creating new business opportunities. With 90% of organizations planning or implementing BYoD strategies today, hear from our panel of Cisco and Citrix experts how desktop virtualization can help address these demands and more. Storage represents one of the most significant investments critical to scalable virtual desktop computing and performance. The newest advancements in server architecture and chip set afford organizations the opportunity to dramatically optimize storage infrastructure while improving overall performance and scalability. Our panelists discuss these newest advancements and how implementers of desktop virtualization can benefit from a more scalable, cost-effective, high-performance storage and computing infrastructure. Growing adoption of Unified Communications and Virtual Desktop Infrastructure creates the potential for conflict, as VDI solutions must support real-time voice and video applications, and voice-versa. But when done right, VDI and UC offers new opportunities resulting in simplified desktop environments that increase user adoption. Get your desktop virtualization initiative on the right track by looking beyond the desktop to the workspace and unleash the full potential of your organization. In this session industry and Cisco experts will provide insights on the strategies IT professional should be considering to achieve and exceptional user experience. This discussion will review the business benefits of combining virtual desktops, voice and video, and how your organization can begin this journey to workspace transformation. Desktop and application virtualization have undergone a radical transformation with the introduction of cheaper, faster storage, graphic acceleration and the rise of integrated and hyper-converged infrastructure. In this series, experts will discuss strategies for planning your desktop transformation, critical considerations across your IT organization, and tips for greater implementation success. Topics are suited for IT managers for desktop services, data centers, security, networking, and applications.